Help kids in your community start the school year prepared and ready to learn! 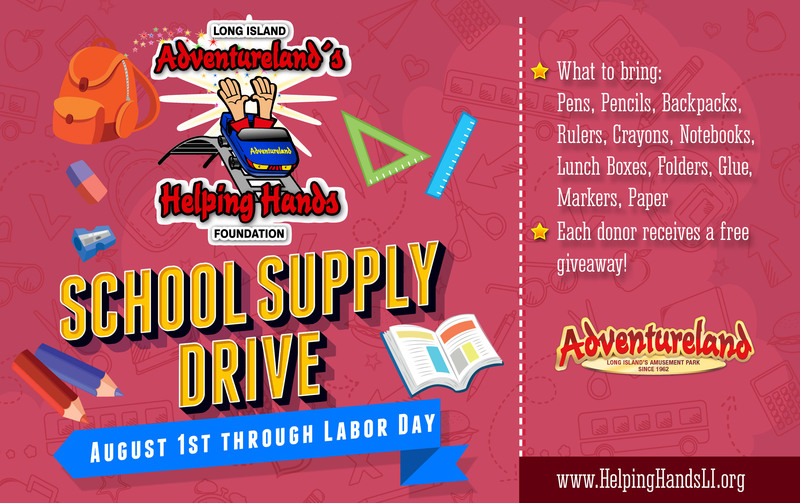 Over the past three years, we've donated thousands of school supplies to students in Wyandanch, Copiague, Uniondale, and Amityville, and members of Long Island Head Start Programs and Hope for Youth. Help us continue this tradition of neighbors helping neighbors! Bring your receipt to Adventureland between 8/1/18-9/3/18 for a free giveaway! Visit Adventureland.us or HelpingHandsLI.org for more info! Raising goods for local schools in need!